It’s been a big month. So big that the thought of even trying to sum it up, or write something pithy has had me avoiding my laptop altogether. But then a wise elder (thanks Grandmama) asked me if I had been writing it all down, and I, the writer, had to admit that no, I had not done any late night scrawling in my journal, had not even made voice memos in my phone at the traffic lights – I’d failed to record what has been one of the most frightening and rewarding and overwhelming things that has ever happened to me. A month ago today, my first novel, Skylarking, hit the shelves of bookshops, hot on the heels of Harry Potter. My wonderful friends started sending me pics of my book on shelves around the city and I was ecstatic at each one I received. I had a radio interview that day with David Astle on 774 and so felt that I might avoid the ‘letdown’ I had read about in Anne Lamott’s Bird by Bird, where she and a writer friend who both released books on the same day sent each other flowers to avoid the emptiness, the silence of the phone. I didn’t have to worry about such things. My crew have kept me in champagne and flowers and my extraordinary publicist had a schedule crammed full of interviews, articles, podcasts and festivals. There were reviews in all the right places. The book was launched on a glittery Melbourne night to a full house at Hill of Content. Everyone, including my publisher, Aviva Tuffield, and the talented and generous Lucy Treloar, said very lovely things and I cried when I tried to thank everyone. It felt kind of enormous. Like a wedding, except that I couldn’t share the limelight and had to meet it head on. A dear friend commissioned a beautiful necklace for me and on it hung a tiny book. My 5 yo cuddled up on my knee later that week, opened the book and began to speak. It took me a moment to realise that she was reciting lines from the first page of Skylarking, which I had never read to her. As I listened and my heart got all wobbly I realised that she had heard Lucy Treloar reading from the book at the launch and had memorised the words. I felt that if I never had anyone say another nice thing about me or my work for as long as I lived that I would have had my fill of emotion – I didn’t have space for any more. Then I went back to my old high school for a local celebration supported by the excellent Eltham Bookshop where I chatted to the fabulous Toni Jordan. As the punters started to show up, I had to steal outside to try and quell the anxiety, the total overwhelm, that I was feeling. There were ex-teachers and old school friends and parents of old school friends and people I didn’t event know. I’m not scared of public speaking, in fact, it’s when I begin to speak on the stage that I begin to calm down. I can control that part. It’s listening to people say that they are proud of me, that they loved the book, that they were moved – it is this that makes me feel like I’m having a heart attack. I feel like I can’t possibly respond in the way that they might like me to, that I won’t live up to their expectation of me, or of myself. Above my desk, there is a scribbled note to myself from a session with my cousellor just before this all began. Not everyone has to like me. I can’t cover all bases. Releasing a book has been an immersive experience in exposure therapy for an anxious perfectionist like me. There are reviews, and as much as I hear the advice not to look, it’s impossible not to. There is GoodReads (best not to look). There is the astonishing fact of readers, out there, who are reading the book and responding in their own way, and some of them are being moved to tears, to grief, to contacting me. There is the imagined pressure that I should be always grateful and thankful coupled with the conflicting pressure to also be authentic, to say it’s been hard work. There are panels and interviews and conversations with incredibly talented and experienced writers who’ve done this before, who have PhDs, who seem to know what they are saying, how to say it, where to hook the battery pack for the microphone. 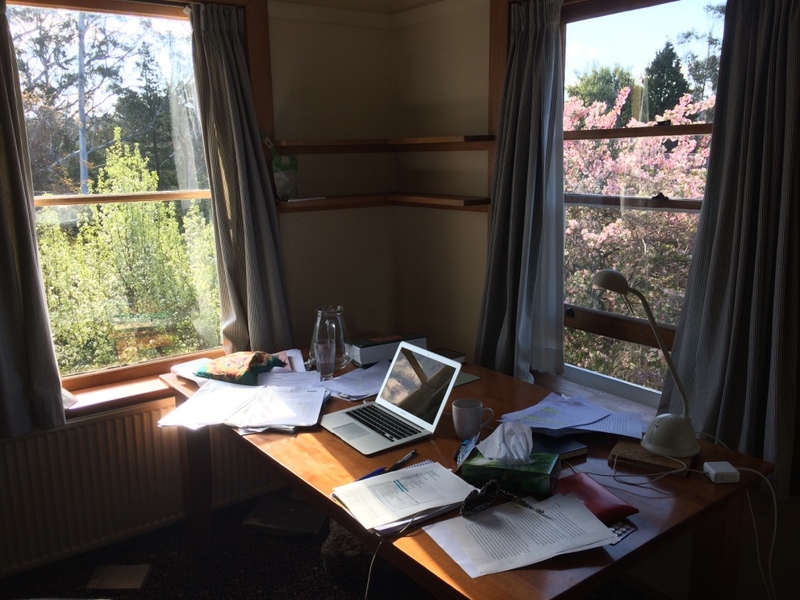 And these writers are generous and lovely but when I searched, I could not find the article I wanted them to have written – something like: How to survive the first month of publication. Or What to pack for your first writers festival. Or How to start writing again when the hoopla dies down. Or, mostly This is how it feels. So I thought I’d write it myself. This is how it felt for me. One month down. I’m excited. And I’m anxious. And I’m everything else in between and around. And that’s ok. This is how it feels. One of the most delightful aspects of this whole publishing-a-book caper is meeting writers; new writers, experienced writers, writers with lovely new books you just want to sink into the couch with and consume in one go. And then there’s the added bonus of preparing for panels at upcoming festivals by…reading more books. Sure – this influx of new books on top of my previous book-acquiring habits and my long hold list at the local library have led to a bit of a book glut, but I’m not complaining, I just want to read them all NOW. The shelf I’ve called – ‘Must Read Immediately’ (as opposed to the six other overflowing shelves just called ‘Must Read’). Catherine Deveny’s Use Your Words – a fabulous writing how-to book I have already gifted to one writing friend. Kate Tempest’s The Bricks That Built the Houses – incredible story, such memorable characters and language that made me weep – so damn good. Jane Harper’s The Dry – compelling debut, already a bestseller. Murder, mystery, country town crackling with drought…definite page-turner. Peggy Frew’s Hope Farm – shortlisted for the Stella and Miles Franklin’s Awards, this one’s been on my must read list for ages and it was worth the wait. Beautifully rendered characters, setting, story. Myfanwy Jones’ Leap (also shortlisted for the Miles Franklin this year) and Jennifer Down’s Our Magic Hour, both deal with grief and relationships and the lives of urban twenty-somethings. Very different books and enjoyed both for different reasons – Jones and Down are both enormously talented writers. And because it’s not ALL about reading these days, I’m also listening to people TALK about reading. I’m loving Unladylike,the new podcast on women and writing from Kelly Gardiner and Adele Walsh. Have to give a special mention to the hilarious Episode 5: On Swearing where Toni Jordan and Patricia Cornelius discuss the art of swearing well. Hanya Yanagihara in conversation with Jason Steger, which you can listen to here. The Emerging Writers’ Festival, where I attended and was involved in a number of events. Amazing festival, great ideas, stellar line up of talent. Launch of Michelle Wright’s debut collection of short stories Fine at Readings Hawthorn. Rajith Savanadasa, in conversation with Dr Mridula Nath Chakraborty, on his debut novel Ruins at Eltham Bookshop. I’m trying to get more ‘present’ (aren’t we all). I’ve nearly done my thirty days of morning meditation (not consecutive unfortunately – but my app doesn’t seem to mind). I’m a fan of the Slow Your Home podcast. I’ve read the books on Mindfulness. There are even great drifts of household refuse piled up in corners of my home, testament to the fact that today I read books with the kids under the doona while it poured, and then went and threw bark in the creek when it stopped, instead of sweeping and washing and tidying and cooking and sorting clothes. And I’m reading Natalie Goldberg’s ‘Writing Down the Bones’, a most excellent book on writing that I picked up in an op shop years ago but only just opened. She enthuses about a certain ‘presentness’ that must be accessed to really get to the bone s, the truths of the writing. There are metaphors about cake baking and heat, about compost, about meditation. I am finding all of it incredibly useful. I was reading it on the train and got so inspired by her idea of being in the moment and bringing the writerly mind that I scribbled down a poem there and then – something I haven’t done in a long time (and lucky for all – indecipherable). I am trying to write a novel. My second – so I thought that I might have some idea about how to do it. The first is here on the desk next to me, all of its pages nestled in the cover, yet to fully meet the world, but as done from my end as it possibly can be. I should have known I suppose, I’ve read other writers lament that one novel doesn’t make you an expert, in fact ten novels doesn’t. I thought at least I’d have a sense of what to do. But it’s such a different beast this one. Last time, I had a road map, a true event, characters, a time and a place: it was hard going yes – but it had a certain pressure, a force behind it which compelled me to write it down. Perhaps this particular story just hasn’t built enough of a head of steam on it yet. Don’t think. Don’t go logical. There’s something I want to say, and a way I want to say it and I’m trying to control what can’t be controlled. I can’t find names for my characters – I keep leaving blanks or changing them, I don’t know the rules about this. Do I name them first? Give them ages? What about the scene that is so vivid, so intense that I can hear the characters whispering in the dense tropical air, feel the crackling friction and desire between them, sense the sleeping children in the room behind the door – how do I get them there? I’m so hamstrung by the thinking, the logic of it all, that it feels an impossible task. Nevertheless. I’m going to try and take Goldberg’s advice. Try and find that place – like Csikszentmihalyi’s ‘flow’ or in the midst of my Varuna bliss – where the words feel like they come through me and not from me – as though I were channeling them from somewhere else entirely. Sounds a bit absurd, I’m the first to admit, but it really is something else when it’s all going right. It’s why we do it. As I recover from a bout of a flu-like thing that was probably just a cold, my bloke encouraged me to get my hands in the soil and sun on my face. We made two wicking beds in old apple crates this summer, which gave us great tomatoes and spicy basil but they have been ready for replanting for a few weeks. My hand was forced when the rest of the family came home from a trip to the local nursery with a tray of seedlings. As I weeded and dug and turned the compost into the earth, I remembered that it wasn’t so hard. There were fat worms in the new compost and the kids were delighted as we sunk our hands between them to plant out rows of carrots and bok choy and leeks. My head was still heavy and I could easily have stayed in bed but there was something about the sun and that verdant green against the black soil that was filling me up again. And thus I was forced to confront that I have been neglecting my writing in much the same way as I had our garden. I’ve made excuses and set schedules that I don’t meet, told myself that I would start tomorrow, or when it felt right, or when I had thought it out some more. But the truth is, there’s a big, fat new idea simmering there, and I am terrified of putting words down lest they all turn out to be rubbish. 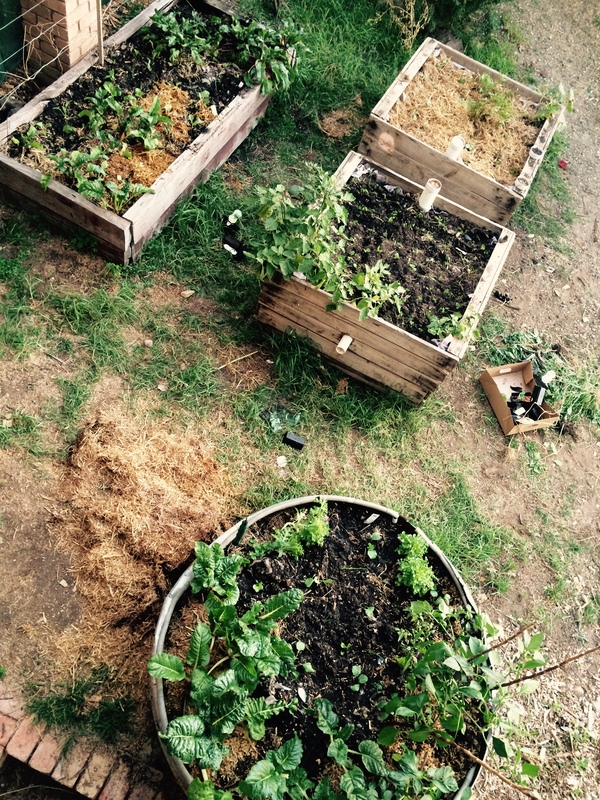 I remind myself that there’s another lesson I’ve learned through our veggie patches. I used to be the kind of person who rips out everything once the season is done; not caring if I destroyed the last ripening tomatoes, or the still going parsely, because all I wanted was a clean slate. I did the same with notebooks; incapable of looking at the pages of scribble that I had lain down only months before, I would ruthlessly tear out everything to start fresh. But it doesn’t work that way. Those tomatoes will be sweet. The parsley will keep on keeping on. There might be a pearler of a line, the tiny seed of an idea in those pages I rip out. Writing the novel (and growing up and being a mum and losing some of the perfectionism) has taught me about the importance of being in the in-between state, a balance of the old and new, the good and the bad, that uncomfortable grey area. There’s dirt under my fingernails tonight, and new seedlings among the established beetroot and the last of the eggplants, and it feels good. Tomorrow I’m going to face the blank page, and those other pages peppered with half lines and ideas and questions to myself. And I’m just going to dig in and start there, see what comes – not worry so much about that bigger thing I am trying to grow. I have a new writing nook, cleverly created by my fella with the Ikea goods I brought home from an adventure I nearly aborted (why oh why do we always forget how tricky it is to fetch and bring home flat pack goods that are longer than we are tall while wrangling small humans?). I am overjoyed at my new space, and procrastinating by planning shelves that will help me organise my crazy world of books. At this stage my categories are: In Progress, To Read When I Get a Moment (the To Read Immediately books continue to make a teetering pile on my bedside table), Recently Read, To Assist with New Project (which I am not writing because there is too much to read), To Lend, To Return, and the important – Just Bought Because I Had To But Not Likely To Read Until Next Summer… It’s a work in progress. Finding Eliza: Power and Colonial Storytelling, Larissa Behrendt. Aboriginal writer, Behrendt, explores the story of Eliza Fraser who was shipwrecked on the island of the Butchulla people in 1836. She uses this story as an example of how Aboriginal people have been portrayed in the stories of colonisers throughout history. I found this enormously helpful as I grappled with editing the final stages of my own novel, and thinking about how, as a non-Aboriginal writer, I have written Aboriginal characters. Clever, thought-provoking – one I will read again. The Light on the Water, Olga Lorenzo. Such a pleasure to read this highly anticipated novel by Lorenzo, whom I am lucky enough to have had as a teacher at RMIT. In it, she tells the story of Anne, two years after she has lost her daughter while walking at Wilsons Prom. Anne is charged with her daughter’s murder and Lorenzo leads us through Anne’s inner world as she is shunned by her community, while she desperately tries to reconstruct what happened and uphold her remaining relationships. I found this taut and complicated and terrible territory to be taken to, but like Charlotte Wood has done in The Natural Way of Things, Lorenzo guides you through the oppressive anxiety and heat of the story until it’s well crafted resolution. Highly recommend. This was recommended to me, and I initially resisted – I had no interest in getting myself worked over a topic that was already making me mad every time I encountered it on social media. But this is a clever, thoughtful, beautifully crafted exploration of the social and cultural history of immunity (along with the science), that Biss weaves through with her own narrative of new motherhood and the fear and confusion she encountered around vaccination. Meticulously researched and unexpected. Well worth a read, even for those who feel they have nothing more to learn on the subject. Six Bedrooms, Tegan Bennett Daylight. Stella shortlisted, this collection of ten short stories takes the reader into the lives of teenagers and those entering adulthood, in the most gentle and fierce of ways. Some of the early stories dragged me straight back to the awkward madness of the teenage years and the last story in the collection, ‘Together alone’, left me gasping. Add it to your To Read list if it isn’t there already. The Year of Magical Thinking, Joan Didion. I am loathe to admit this was my first encounter with Joan Didion. I am now trying to ‘catch up’ on her extraordinary body of work. This is the memoir of the year after the unexpected death of her husband of over forty years. It is extraordinary. At times, Didion holds her grief at arm’s length to observe and analyse it, and then she takes the reader with her into her free fall into the ‘magical’ thinking, where she believes she can not get rid of her husband’s shoes, because he is coming back. Heartbreaking and intelligent. I’m so thankful I now have Didion in my reading arsenal. And here we are. 2016. I’m a little late, in truth, in getting to the year because I have been hiding out at the beach with my family for three whole weeks. Three weeks of river and sea and sand and campfires and reading books in the hammock and NO phones and NO internet and NO manuscript. But now we’re back. And I have been hiding away again, in the local library this time, going through the copyedit on the book, and relishing that fresh, ‘start of the year’ feeling which has me exhilarated at the alarming drop in the word count as I cut and slash. It’s nearly there. It spurred me on, to come back and see Skylarking mentioned in some lists of ‘What to Read in 2016’; in the Age, and in Arts Hub, and in another Age article about YA. That feels wonderful. And terrifying, but I’m focusing on the wonderful at the minute. Sally Piper – Grace’s Table. A wonderful character, great structure and beautiful take on friendship and ageing and family, amongst other things. Was so good to finally read Sally’s book after learning so much from her about the writing of it, and writing in general, at our shared week at Varuna last year. Charlotte Wood – The Natural Way of Things. Everything they say is true. Magnificent. Must-read. Debra Adelaide – The Women’s Pages. Interesting concept, complex character. I think Adelaide is a wonderful writer. Satisfying. Hanya Yanagihara – A Little Life. Devoured this. Had to scribble some of the passages down in my journal for their beauty. Wept. Big read – totally worth it. Maya Linden, Christie Nieman, Maggie Scott, Natalie Kon-Yu and Miriam Sved – Just Between Us: Australian writers tell the truth about female friendship. Wow. Lots of the stories here rang true and lots didn’t – so many stories about terrible friendship break ups which I have been fortunate enough not to have had. But made me think lots about friendship and women and how we play it, and how important it is. Still thinking. And so very grateful for the women in my life. James Bradley – Clade. Harrowing look at the not too distant future through the story of one family. Terrifying and beautiful at times and somehow hopeful. What was on your summer read list? And should I add those titles to mine? Listening to Geraldine Brooks on radio this week, I heard her say that writing was like ‘building a stone wall’ – just putting one stone on top of another. Thank you, Geraldine. Our very own stone wall. A real one. Courtesy of my father-in-law who knows everything about doing things stone by stone. Because this week, at a borrowed desk (thanks to Kelly Gardiner) and at cafes and libraries, on borrowed time (thanks to my husband and parents and the various wonderful people we pay to look after our children), I have been grappling with first taking apart my manuscript and then trying to piece it together again, word by word, stone by stone. So, onwards. Stone by stone. I will stop looking at the whole unwieldy mass of notes and versions and deletions and additions and timelines and character lists and emails from my editor and her notes (sometime in red AND in bold) and take it a sentence at a time. Word by word when need be. Knowing that others, dear friends among them, are facing far greater and more significant challenges in their life (challenges that really are real and not writerly angst) in much the same manner – hour by hour, day by day, one stone at a time. This is easy, in comparison. I’ll take a leaf from their books. 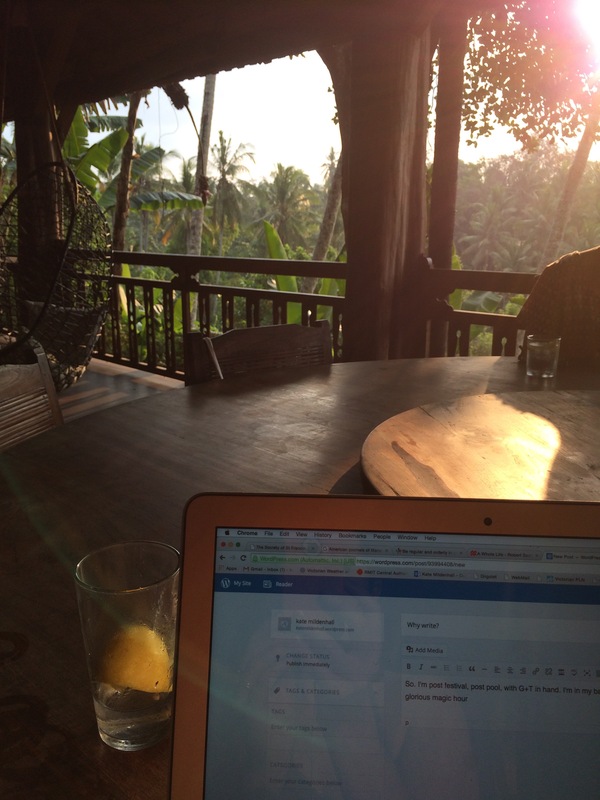 There is a draft of a post from Ubud. I started it as I looked out over the jungle from my little perch in our balinese villa. I would have been in my bathers, I might have had a cuppa, but more likely a g + t. The air would have been dense with heat and chattering of monkeys. I would have been able to smell the frangipani. Needless to say, I never finished that post. The view from here is not quite so satisfying. I am dashing this off before I pick the kids up from kinder and child care. It is a task in a list that includes dishes and washing and cooking and filling in kinder forms and dancing re-enrolment and uploading photos so I can start on the Christmas books. Thinking about Christmas obviously leads to a slight panic attack and frenzied online searching and list making… There is no room for writing today, I tell myself, but then I read Rowena Tuziak’s post about life getting in the way and putting the writing first, and I decide I have to make room. I have to choose to make room. When I last wrote here I dangled the cliff hanger – will she or won’t she be able to finish the draft while she sits by the pool drinking cocktails in Bali?! The short answer is no. No, I didn’t finish the draft then, but I worked hard in the bits between classes and panels and nights under lanterns strung in garden jungles filled with interesting people and conversation and Bintang. I worked between listening and learning from writers like Brigid Delaney, Clem Ford, Liam Pieper, Deddy Arsya, Emily Bitto, Antonia Hayes, Sofie Laguna, Okky Madasari, Amanda Curtin, Nam Le and Isa Kamari. I could not work after People of Letters because I was so emotionally wrecked. It featured, among others, Chigozie Obioma, Ayelet Waldman, and Finegan Kruckemeyer, upon whom I developed an instant writerly crush both because his words were so perfectly crafted and because he spoke about cradling his baby when I was so missing mine. There were tears. I worked, fuelled by the insights and conversations about writing as a political act, about how fiction can change minds, about how history can be viewed through different lenses, about friendship and feminism and corruption and writerly angst. I wish I had seen more of the panels, especially the local ones in the light of the censorship issues. I wish I had talked to more of the writers. I wish I had explored more, stayed out later, got up earlier, eaten less, drunk less, drunk more, even… Some part of me wishes I had got stuck by the fickle volcano dust so that I could have continued to write in the glorious surrounds of Ubud. But then I think of how my four year old daughter greeted me with the words ‘Mum, I was so excited to see you today that my eyeballs nearly popped out of their sockets!’, and I know I would have been frantic to be away from them for much longer. I didn’t finish working on the draft in Ubud, but I did finish it when I got home (although I use the word ‘finish’ loosely). I have sent it off to my editor. And I nervously await her comments. What if it isn’t the thing she thought it would be, says the little voice of self-doubt. What if it isn’t any good after all? I know that voice now and know that nearly every writer carries it within them and they try and find ways to ignore it. Or they use it to push them forward and through the hard work of tearing apart their manuscript, building it back up again piece by piece, making it as good as it can be. When asked ‘Why write?’ on one of the panels in Ubud, Liam Pieper quoted Hemingway’s advice (or not Hemingway’s – depending on who you listen to): ‘Write drunk, edit sober’. Ubud, and Varuna before it, have been part of the glorious ‘drunkness’ and uninhibited creativeness of the writing process of ‘Skylarking’ so far. Now for the editing, and some serious sobriety. It’s now two weeks since I left the magic of Varuna. I returned home to brilliant cuddles with my girls and full of energy for the manuscript, for being a calm and present mum for a while, for ‘resisting re-entry’ and trying to keep a sense of that Varuna quiet. It didn’t last long. But madness is also wonderful. And it has been a mad, and delightful, fortnight including a weekend with dear friends in Bright, a smashed window in the lounge room due to an accidentally but perfectly aimed Lightning McQueen, uni assignments, kinder excursions and a visiting duck who has made himself at home at our place. But the writing must go on. And it has. In snippets and bursts and with the first edits back from my publisher on some extracts (terrifying and validating in equal measure). I’m giving it a little time to sit, to let the new writing settle; new writing that seems so spot on when it comes spewing out, and then, a week later is so clunky and wrong. Knowing, as I now do, that the longer I let it sit, the more faults I find, I fear that perhaps I should have told the publisher to give me 6 years and not 6 months…alas, I don’t think they make those kinds of deals with first timers. I’ve made a long list of questions to myself on each chapter: Does this fit with what I said earlier about this character? Match box or flint box? Would she really have said that? What does a whale feel like to touch? And I’ve been prodded to ask others from the wonderful readers in my writing group: how long can you leave a dead body before there is a smell, for instance. Not somewhere I really wanted to go I’ll admit, but go there I must. It’s a slow process, a cathartic one. Less in more, is the instruction from my editor. I’m wielding the red pen (in the form of the delete button) with a kind of mania. It feels good. It’s a freedom of sorts, I suppose, letting go of that which I have sweated and toiled over. It’s all there, behind what is left, and the words that are left are the stronger for it. So – on the home stretch now. The start of the home stretch at least. And just to really let the writing settle completely, I’m taking it on retreat. To Ubud. Because somehow I won a trip to the Writers Festival there, and time with other writers and a masterclass with The Guardian and space and quiet (and cocktails by the pool) where I can finish this thing – the next draft at least. I’m banishing the mother-guilt (again) and packing my list of questions and notes and hoping that my ear and my nose for the rugged 1880s east coast of Australia will be heightened by the fact that I’m sitting next to a pool in Bali with a G+T. Hope so. So here I am, on my last full day of a blissful week at Varuna. What a week. 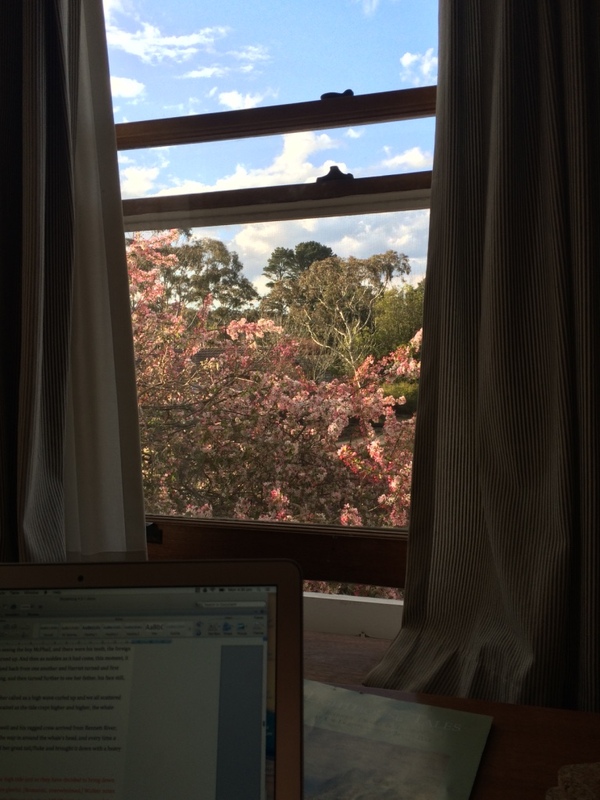 Beyond my computer, and half drunk cups of tea, piles of manuscript and well-thumbed books, is the window and the pink and white of the crab apple tree in blossom. It is windy up here today and the blossom is blowing off in drifts. There is purple wisteria winding up through the branches and it reminds me of the great arch of it going over the monkey bars at Millicent Street, where my grandparents lived for so long. I have done what I came here to do. I wrote my 15 000 words (and then cut most of them away). I’ve read it through from start to end. I’ve done other things too; I’ve cried a bit. And walked. And drunk wine with the fine writers who occupy the other rooms. Been warmly looked after by Sheila and her amazing dinners. Slept. The sleep of a person who has not slept a night through without little calls in the night, and little arms and legs wrapped round head and body, for quite some time. And oh, how I have missed my girls. The great gift of Varuna is not only the beauty, the quiet, the monastic rigour of writers doing their thing all day and then debriefing about it at night. Not only the way you are cared for, with good food and good company, and a break from the mind-numbing domesticity of normal life. 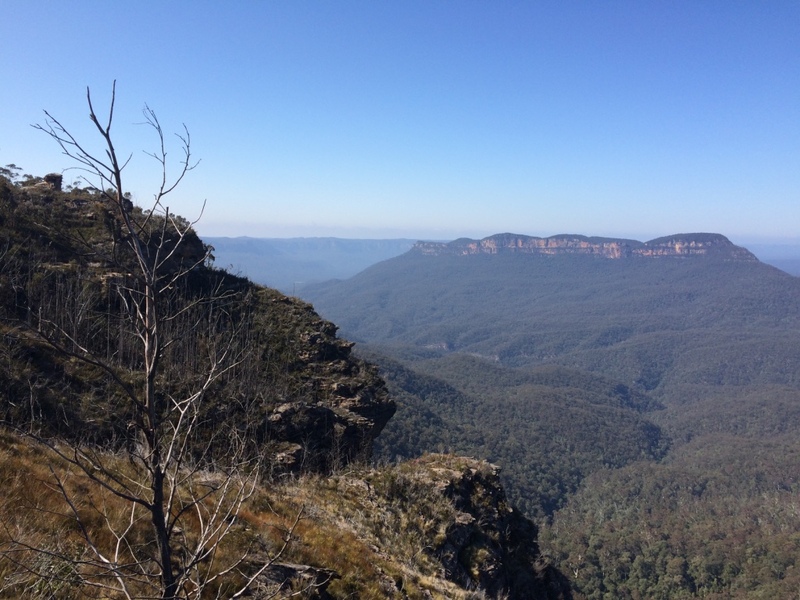 Not only the proximity to the edge – the walks and the views out to the abyss and the beautiful Blue Mountains (‘alarming’ as Lucinda said, and breathtaking). It is the great respect and validation given to writing, and the writer doing the writing; that this is something important and legitimate and even, perhaps, a little brave. Until now I have tended to churn out hunks of writing in stolen time (and time gifted by my wonderful partner and family I’ll admit), but it is piecemeal, often random. It does not connect from one session to the next, and I spend so much time scrabbling back into the world of the story that I scratch out a few hundred words and then have to leave it again. But here, here I have understood process. How all the pieces can suddenly pull together and start to resemble something that I can see will one day be whole and complete. How I can go to sleep with a problem of character or plot that seems unfixable and wake up in the morning with an answer. And have time to go and write that answer in. How it is work, hard work, to keep getting the words down and make them make sense, and then take them out again, and go up against the self-doubt and fear each day, that every word is rubbish and everyone will hate it. I went through an entire tissue box as I wrote the last chapters. Partly in sheer relief that I had got there. And also, of course, because I love my characters and don’t quite know what I will do when they are not rattling around in my head. I cried too, because I still couldn’t quite believe the gift of being here, having the time and space to have that moment, to write ‘The End’ (a little dramatically and untruthfully even because it is so far from done) on the last page of this unwieldy document. So, back to it. There are at least six more hours I can fill with writing and editing and reading and thinking. And even though it would be a crime to take any of it for granted, I might just sit and look out at the blossom.